The Standard Hidden Granite Bracket makes for a fast and easy installation. Mounted on the top of your knee / pony wall and affixed with 4 #12 wood screws (included with the bracket). This bracket provides excellent support and prevents the countertop from tipping over or cracking when leaned on. The Standard Plus Hidden Granite Bracket makes for a fast and easy installation. Mounted on the top and back of your knee / pony wall for extra support and affixed with 4 #12 wood screws (included with the bracket). This bracket provides excellent support and prevents the countertop from tipping over or cracking when leaned on. 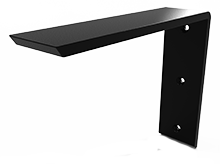 The Forward L Hidden Granite Bracket is used when you need to get that extra grip on a structure or knee wall. The bracket mounts to the top and rear of the knee wall with #12 wood screws (included with the bracket). The Countertop Island Support is designed to support Island overhangs and breakfast bars. Our Front Mounting Countertop Supports for granite or other solid surface applications are designed to be mounted directly to a stud or used with a backing plate in either an existing installation or in a new installation. This Side Mount Hidden Bracket should be used when you need to get that extra grip on a structure or a wall. This bracket is used to get the support you need when you don't have the space in a cabinet or you need to support a granite countertop off the face of a wall by connecting to the studs in the wall. 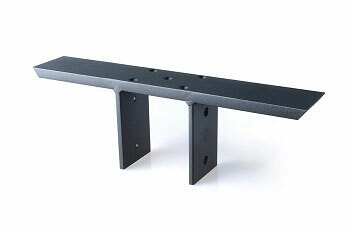 This Granite Bracket is used for floating countertops and shelves directly off a wall. Made of 1/2 inch steel its a great solution and simple to install. This is our preferred Support Bracket for applications that require support that evenly spans both sided of a knee wall or other structure.